Annual house price inflation is still edging up, according to the latest survey from the Halifax, although prices fell between May and June. Prices in the three months to June were up 8.8% from a year earlier, it said, up from the previous figure of 8.7%. However, the survey provides further evidence that the rate of house price growth is starting to moderate. The Halifax said prices fell by 0.6% between May and June, the fourth monthly fall since last December. On the more reliable quarterly measure, prices in the three months to June were up 2.3% compared with the previous three months. The UK's largest mortgage lender said the quarter-on-quarter rises had remained steady between 2.0% and 2.3% since June 2013. 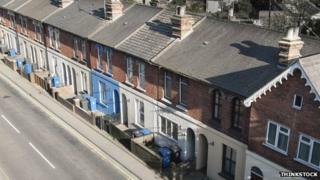 The average house price across the UK is now £183,462, said the Halifax. "Housing demand continues to be supported by an economic recovery that is gathering pace, with employment levels growing and rising consumer confidence, although real earnings growth remains sluggish," said Stephen Noakes, Halifax's mortgage director. Last week, the Nationwide Building Society said prices had risen by 11.8% in the last year, and were now higher than at the peak of the market in 2007. However, in June, the Bank of England's Financial Policy Committee (FPC) acted to try to prevent the housing market from overheating. The committee was worried that both banks and homeowners could become saddled by too much debt, which would harm the economy. As a result, the FPC ruled that lenders would have to apply tighter affordability checks to anyone who wants to take out a mortgage. Borrowers will need to prove they can withstand a 3% rise in interest rates from their current low level. In addition, lenders will only be able to offer riskier mortgages - where the amount lent is 4.5 times the borrower's annual income - to no more than 15% of their customers. The new rules will take effect in October this year.